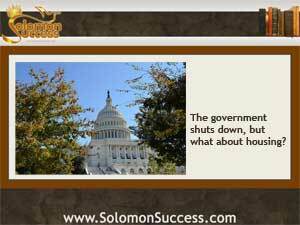 In King Solomon’s age of monarchs and principalities, government shutdowns didn’t happen, but his views on the obligations of rulers to make fair and reasoned decisions still stand, as the US government goes on hiatus for an indefinite period. While massive numbers of federal workers stay home and government programs across the country close their doors, housing advocates worry about what the shutdown might mean for the newly recovering housing market. But the Department of Housing and Urban Development has a plan to keep the pipeline of government-originated mortgages moving along. The government has taken time outs before, leaving consumers and service providers scrambling to keep things moving smoothly until the crisis is resolved. In the current situation, though, housing advocates and industru representatives fear that a shutdown could mean a moratorium on mortgage loans – a key piece of keeping the housing recovery going. So mortgage lenders and real estate professionals are taking a closer look at HUD’s contingency planning. Although government’s role in housing has been the subject of recent debates and the target of new bills floated by both parties, for now various government backed entities, including the Federal Housing Administration and quasi-government bodies Fannie Mae and Freddie Mac, originate about two thirds of the residential mortgages available both to investors and residential homebuyers in the country. A government shut down of whatever duration could stall new lending and the processing of current loans. But HUD has a plan although a new report by HousingWire points out that the plan has undergone a number of changes, leaving housing professionals scrambling to get the latest information. The most recent version available allows for HUD to continue to endorse lending in the wake of a shutdown – but only for single-family home loans. Under the housing contingency plan, the FHA would be able to generate single-family home mortgages during a government shutdown. A small percentage of HUD’s more than 9,000 staffers would also stay on the job to process new loans. Because mortgages originating with the FHA and its cousins Fannie and Freddie are serviced by banks and other financial institutes around the country, private lenders are also keeping an uneasy eye on the machinations in Washington and the final outcome of HUD’s contingency planning.